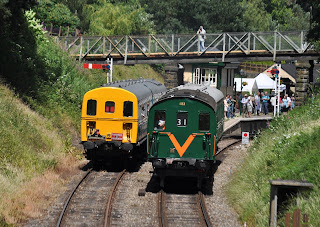 Different styles of Thumper meet at Eridge on the Spa Valley Railway. 1317 and 1133 on loan from the Lavender Line. 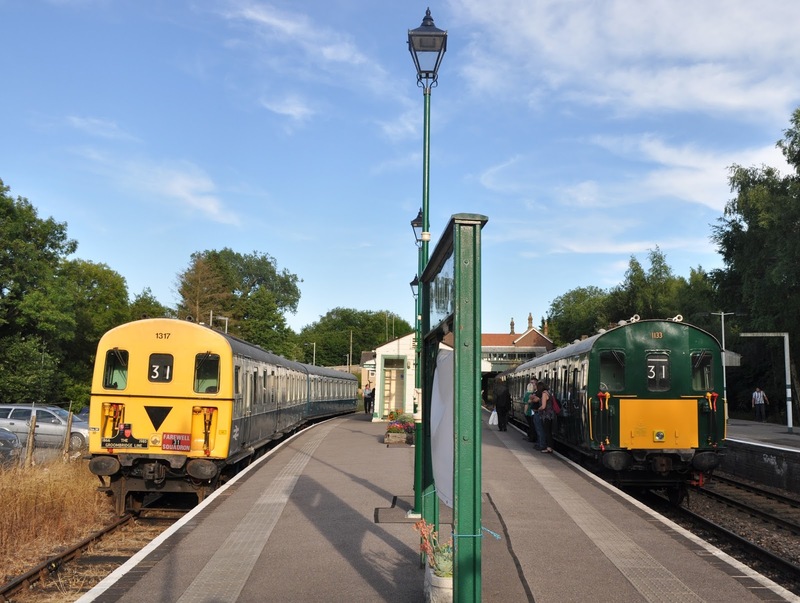 The weekend of 4th and 5th July 2015 marked a historic occasion for the Spa Valley Railway- it was 30 years since the closure of the original line from Eridge to Tunbridge Wells. 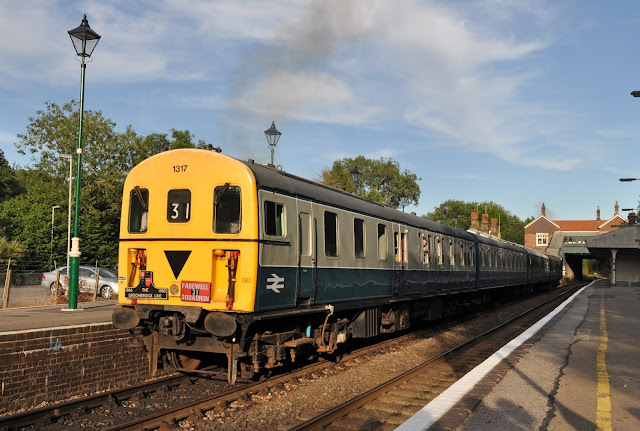 To mark the anniversary it was decided to do something special, and thanks to many very generous donations to raise the funds for road transportation it was agreed to bring a 'guest' class 205 Thumper unit to the line to join the resident class 207. 'Oxted' 2D 1317 was one of the units working on the line on its very last day, so it was fitting that the DEMU was purchased by the Spa Valley Railway when it finished its service with Southern (numbered 207017) in 2004. It has been restored to blue/grey livery as it would have worn on the last day of service. In the future the the unit will also be re-united with it's original trailer coach which is currently being restored. 1317 has been restored beautifully and is in many ways the best example of a thumper in preservation- it will be the only three car set, and also unlike the remainder of it's class mate and the class 205's it retained its original filament lamps throughout it's BR career while other units received more modern strip lighting. The units has been finished internally with prototypical 'trojan' moquette seat covers and looks quite the part. the near platform - still used by Southern services today. 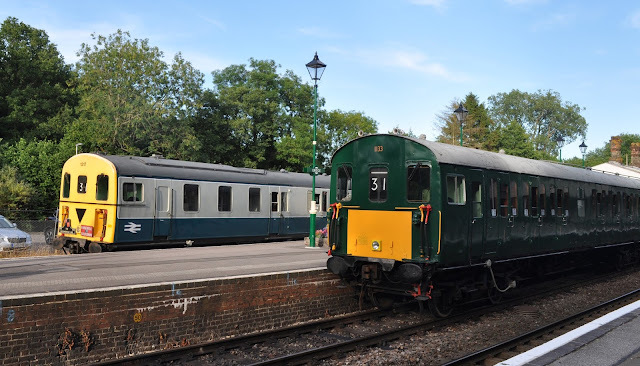 1133 is a slightly older 'Hampshire' unit which passed to the Lavender Line on completion of its service with Southern (as 205033) on the (London)-Oxted-Uckfield and Ashford-Hastings routes. 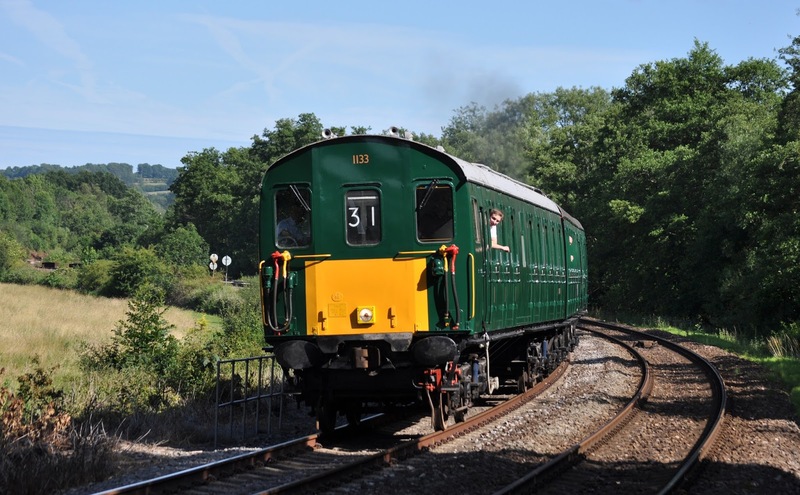 The motor car has been restored to a high standard and currently runs with the restored driving trailer coach from 205021, on loan from Hastings Diesels. 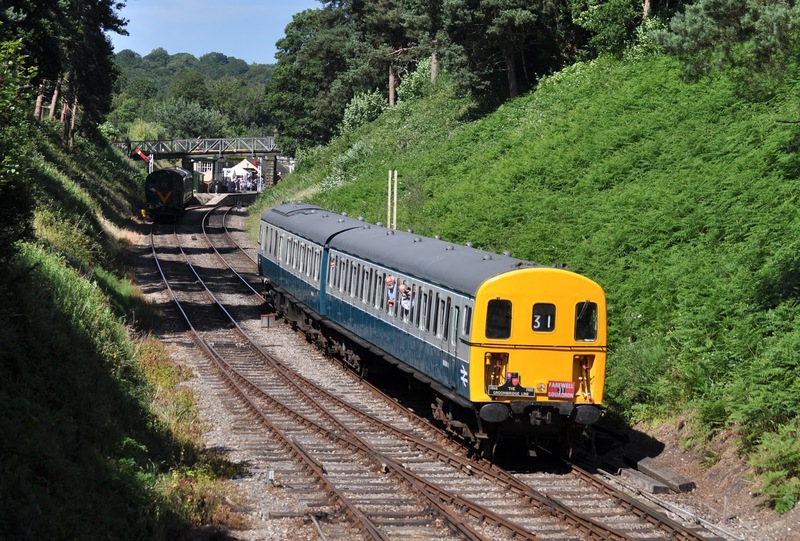 While 1133 did not run on the final day of the Tunbridge Wells - Eridge line (that honour befell 1125 which hauled the final train) the unit did take part in the final 'Last Thump' railtours bringing down the curtain of the class running on the British main line for Southern. Complete with the headboards from 30 years ago 1317 prepares to lead the 4 car train away from Eridge. On the Saturday the two units operated all services on the line and the weather was beautiful from start to finish making this a fantastic, and well supported day out. Later on in the evening both thumpers joined together to run as a 4 car train. There was even a special photo-shoot organised at Eridge where the units were shunted into adjacent platforms in order to re-create the side by side photograph from 30 years earlier. stand side by side at Eridge. end styling can clearly be seen. All in all I think everyone agreed that this was a splendid day out and one which no thumper fan would want to have missed. If you did- 1133 will be staying at the Spa Valley for the summer affording a few more opportunities to catch the DEMU's together- the next at the railways summer diesel gala from 30th July- 2nd June. track is the mainline from Oxted to Uckfield. 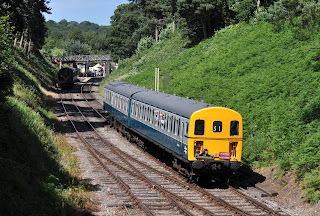 Also running on the Saturday was another DEMU- Hastings Diesels 1001, these days the only Thumper to get a chance to stretch its legs on the mainline network. A sighting of 1001 working the Warwickshire Wanderer tour brings the total number of 4-SRKT engines heard for the day to four- not something easy to achieve since 2004 when thumpers bowed off the main line! 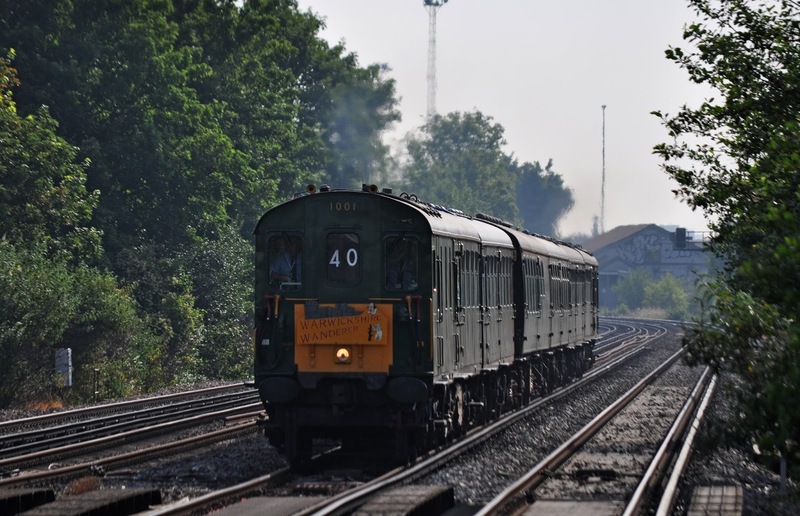 1001 with the Warwickshire Wanderer railtour bound for Stratford on Avon seen passing Wandsworth Town.